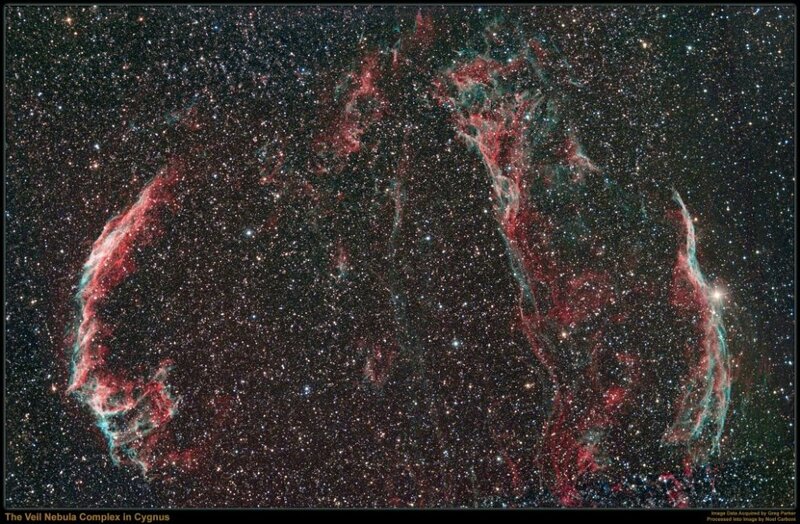 The last RGB image of the Veil nebula has been significantly improved by adding some H-alpha and some OIII narrowband data as can be seen in the accompanying image. However, the project has turned into an even bigger undertaking. I decided that I needed to get the nebulosity south of this region, so I embarked on a full two-frame Sky 90/M25C mosaic to capture the whole of the Veil complex. I now only need the RGB data of the southern region (H-alpha and OIII already taken) in order to have an extremely deep and detailed image of the whole of the Veil. The statistics make frightening reading. So far I have taken 142 sub-exposures amounting to 27 hours total imaging time and a 1.7 GB file size. The addition of the final RGB data is likely to take this project to over 30 hours total imaging time with a file size in excess of 2 GB. I am not sure I will undertake such a mammoth task again without the aid of the mini-WASP array! This entry was posted in Sky 90 and SXVF-M25C, Veil Nebula and tagged Sky 90, SXVF-M25C, Veil Nebula. Bookmark the permalink.